Our morning started very early at 3:30 am. The weather was a brisk 32 degrees with light 8 mph winds. The temps would be 41 when we finished. An important factor that would come into play later was my stomach was not right all morning. Not a good thing to have right before the long run ahead of us. Outfit wise I went with shorts, short sleeved shirt (actually wore the Chicago Marathon Race shirt cause it was awesome), arm warmers, throw away gloves and hat, and throw away shirt. We had our space blankets from the USAF Half Marathon with us at the start. We made sure to get to the open corral as soon as it opened because of the warning of how quickly they fill up. I don’t know if it was the weather that kept people from showing up early, but we ended up just us an two other people waiting for an hour. They too were warned about early corral fill up. They were also first timers and we chatted it up about our training. We froze the whole time while we waited. We got to be at the front of the corral and chatted it up with the volunteers that were in charge of corral security. My feet were frozen up to the arches by the time we started. When they released our corral we got to run up to the start which made for a nice warm up. We had to be careful to not trip on any of the clothes that were lying all over the road. And we were off! I was on a good pace right from the beginning. I was expecting a couple warm up miles due to the people congestion, but it really wasn’t bad at all. I had packed little sandwiches for my fuel that were one slice of whole wheat bread, natural peanut butter and honey. I ate a half of sandwich at four miles and planned to eat a half every four miles through the race. I also made sure to have a mix of gatorade and water along the way. My legs were feeling great! My stomach….not so much. After my mile 8 half sandwich my stomach fought back. It was making horrible noises and I knew I was going to have to plan a stop. I wanted to make sure that if I did stop that I was ready to go since before the race I had no luck resolving the issue. As my stomach churned I was still doing okay with pace and came across the half at 1:52. Rob was getting a lot of response to his USAF Mararthon shirt, here is he waving to someone in the crowd who shouted Go USAF! My second and equally difficult challenge was my IT bands. They tightend up at mile 10 and I thought about how I should have KT taped them to try and help them, maybe wear capris to keep them warmer, etc. There was nothing I could do, but deal with them hurting and tightening up. The sequence of events is a blur in my head, but at mile 10 I saw Rob! I passed him and we said “go baby” to each other. Mile 14 I made a pit stop thinking I was very ready to resolve my stomach problems and no dice! I lost 2-3 minutes screwing around with a pit stop and still had this awful stomach pain. Mile 16 was my last sandwich half cause I couldn’t take the stomach pain any more. I was going to try and get by with gatorade. Yep, got food stuck in my teeth and was dealing with it when I notice I got my picture taken. My pace also deminished with my IT bands that continued to tighten. I wasn’t running at my usual paces and I was just existing. The good thing was the whole way the distance never daunted me. I was never put off by how much further we had to go. I was just feeling like I was missing out on one of the most perfect races (crowds, weather, aid stations) because my body was not holding up. I’m not sad, just feel like I didn’t get all that I had planned to do. I was hoping to feel like I had come to this race with everything I had, which just wasn’t going to be today. The crowds were AMAZING!!! We were worried that with the cold the crowds wouldn’t be the same, but we were luckily wrong. Everyone was so supportive and it was fun to have such large crowds throughout the course. So the highlights and thoughts of the race I’ll list in order as I can’t say I paid much attention to my exact whereabouts. Heading North – Man we are North! Beautiful park like area. Heading Back South – Loving the crowd support! Boystown – Crowd support was awesome!! Guys choreographed dancing, drag queens singing. What a blast! Later on – Cheerleaders! Colors looked to be blue, white and maybe silver. I threw them a few cheer moves (upper body only) and they were pumped and gave me back the cheer nod and we all said #1! Let’s go!! Then the amazing brownstones – beautiful homes!! China Town – Holy Crap!!! The crowds were huge!! 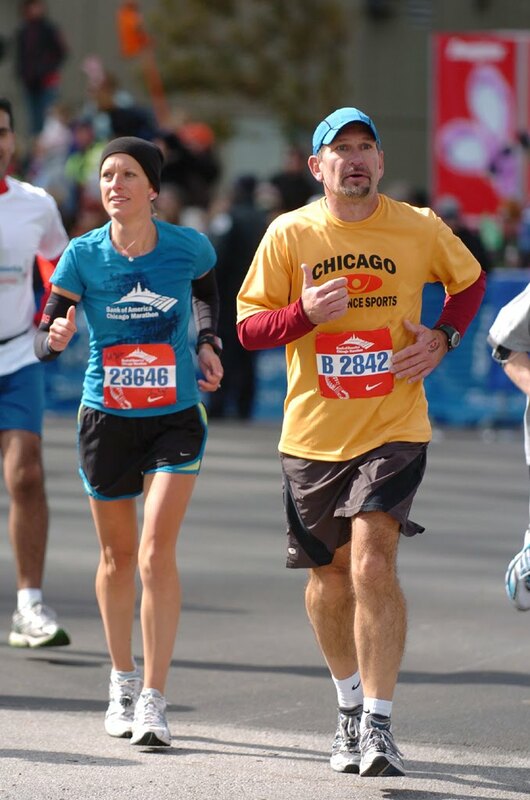 Running through China Town was just that Chicago Marathon feeling, you knew you were at the one of the best races in the world! Later on – More Cheerleaders! There colors were brown and white. I threw up some cheer moves (upper body only) and they responded with the same cheer enthusiasm. At 22 mile mark – 10K to go. 10K actually feels a lot further after doing 22 miles. It’s not right around the corner feeling, but I also wasn’t scared about the remaining miles. The rest was just getting my legs to move as fast as they could. My IT bands had fully tightened up. 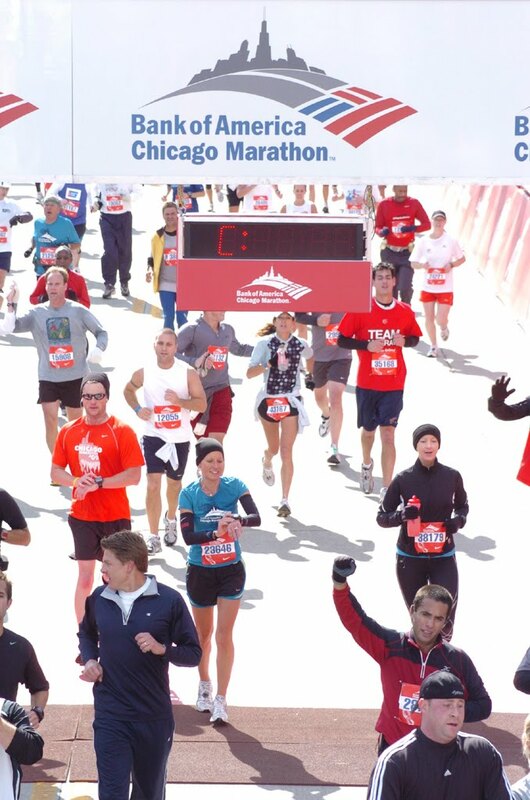 “*name of runner*…Believe” – This sign was at mile 20 something and choked me up. On a side note I PRed my 15K time. Wasn’t hard to do since the only 15K I’ve done is hilly and this was nice and flat, but at least it was a recorded improvement! Since I had made a pit stop and was off my pace I wasn’t sure where Rob was on the course. We had a meet up plan after the race. On paper the meet up location looked good, in reality after running it was far! I got my space blanket, some cookies, water and was freezing. Lesson learned: bring clothes to gear check and a pay as you go phone so we could have texted each other and not freeze waiting around. I hobbled my way to the meet up location. Not long after Rob showed up and I nearly knocked him over hugging him. He had his own body struggles of hamstrings and bottom of his feet. Bottom of the feet is a hard thing to run through as I’ve tried it on a long run before, never a marathon. So there you have it, we survived! We are marathoners! We learned a lot! We are hungry for more! Can’t wait to get to the training for the next one in February! We will be on a 5 week recovery plan before getting into our next training plan. Thanks everyone for all of your encouraging words and support through this whole thing! When we finally got back to our room and cleaned up we went to lunch at The Grill. Everyone in Chicago is so nice. We had people who saw us hobbling with our medals on stop and congratulate us and ask us about the race and our running background. 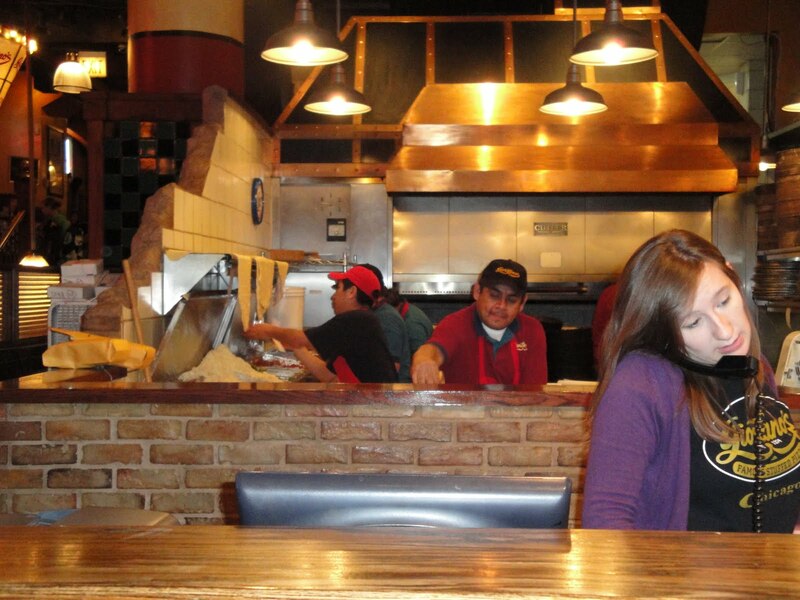 Later we took a nap and then headed out for dinner at Giordano’s on Rush St. The food was amazing! Rob got a small special thin crust pizza and I went with the small spinach ravioli with marinara. It was so delicious and worth the hour and a half wait. We will definitely be back for more! 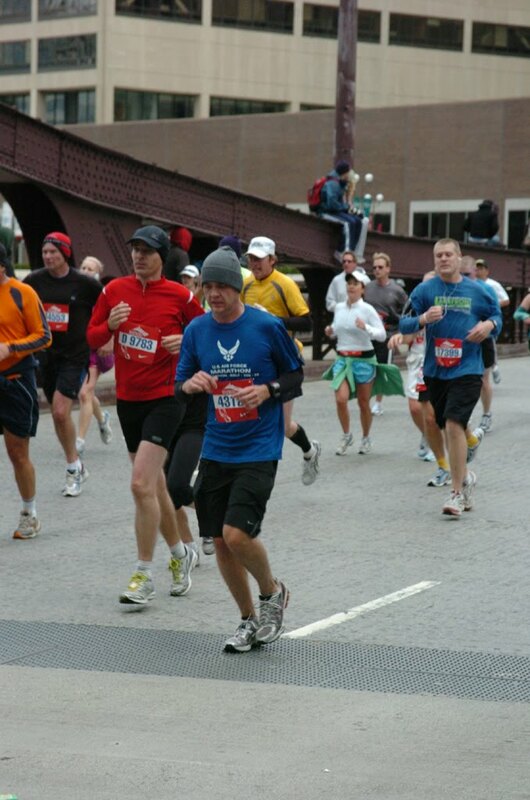 A video of the Chicago Marathon on Runner’s World produced by News 5. 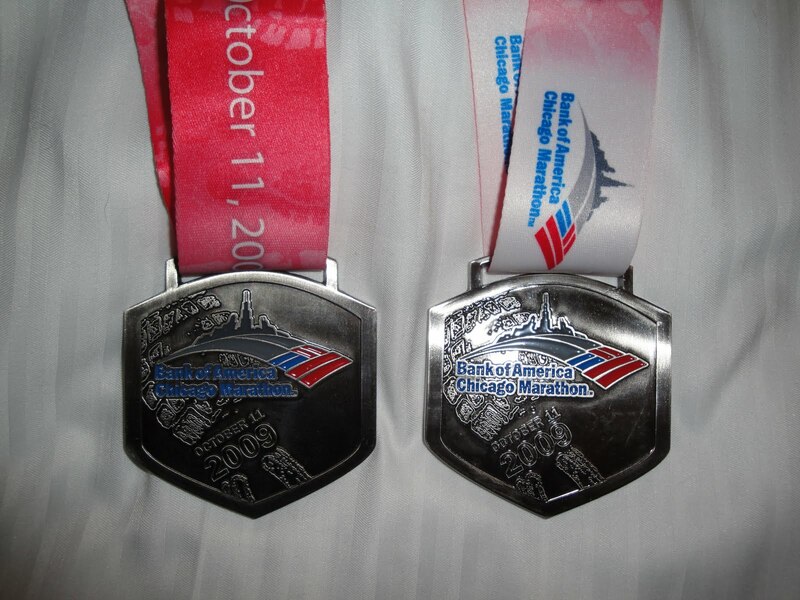 Categories: Chicago Marathon, Race | Permalink. Nice Job!! 4:08 is a wonderful time for your first!! It sounds like you guys had fun. Too bad about your tummy, it happens! Which one are you doing next? I LOVE the pics! 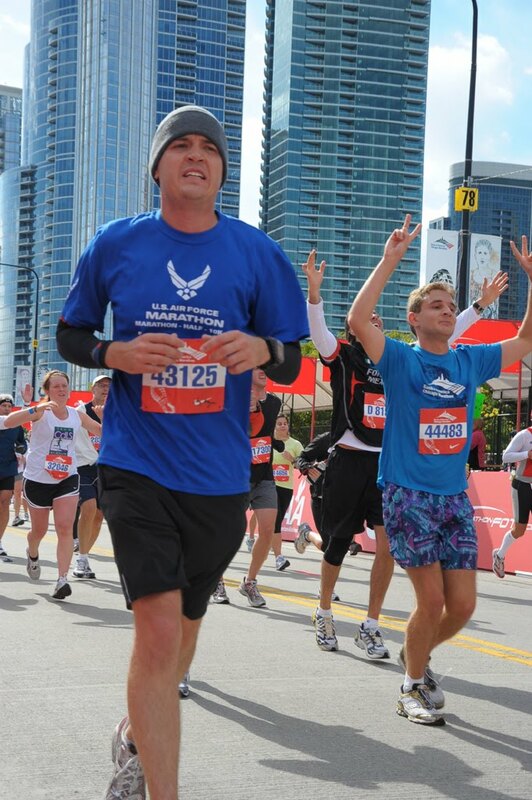 Congrats on your first marathon – this seems like the perfect one for your first time! 4:08 is amazing for your first marathon and you even had stomach & IT issues! You should be so proud!Oh and the Gay Pride area is called Boystown. 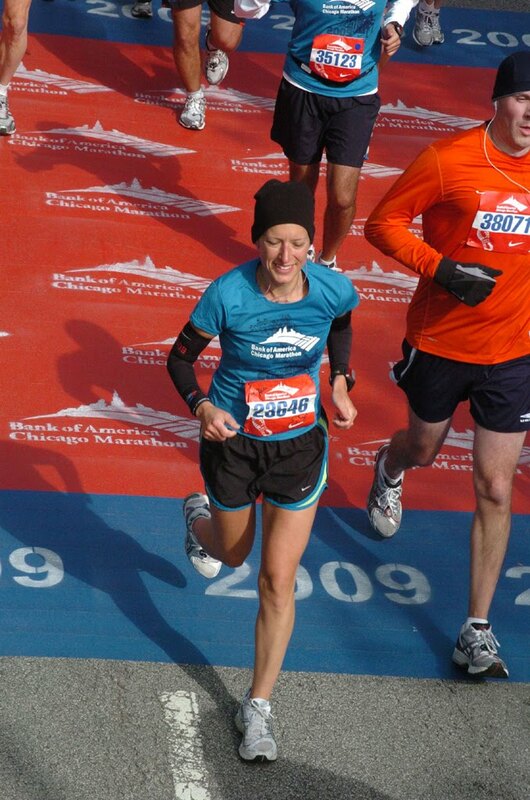 Congrats on finishing Chicago – and running an awesome race despite stomach problems, IT band issues and the cold. 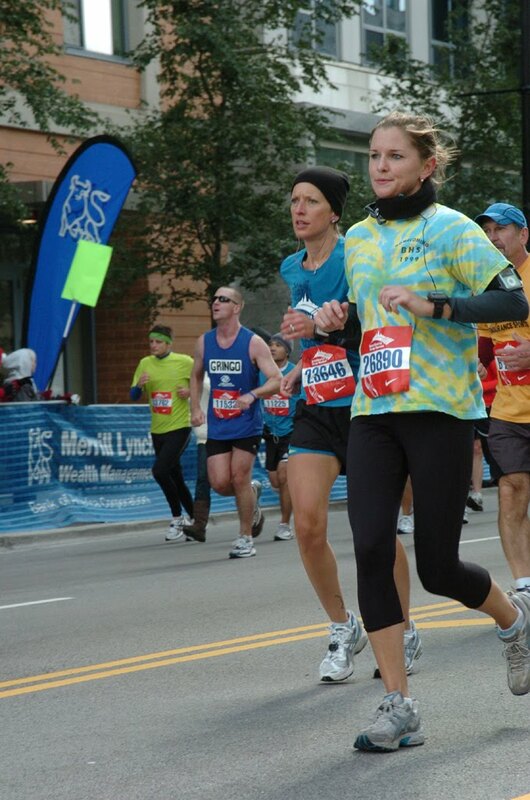 You should be SO proud – and know that you will TOTALLY ROCK your next marathon. I love the pictures – you look SO pretty at dinner!! 🙂 Congrats again!! Congrats! Such an amazing time, and it sounds like the whole experience was awesome. Congratulations! You did it! And better yet, everything that you learned will help you toward your next marathon. Btw, loved your description of the crowds along the way. Congrats again! Hi! You don't know me but I have been following your blog for quite a while now and I just have to say CONGRATS!!! You inspire me with how determined you are! CJ you really do inspire a ton of blog followers with your hardwork and determination. I was following your progress online, and was cheering you on. Congrats on such a wonderful FIRST marathon experience. I can't wait to follow your progress over the winter and next training. I think we need to start bets on when you break a 22:00 5k.Please give my congrats to Rob too. After my half next weekend we will have to schedule that fly-in lunch. 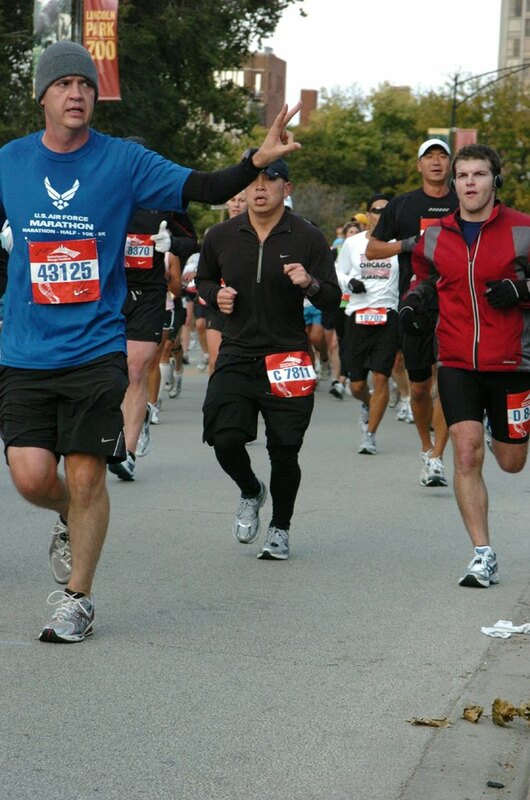 Chicago is a great place for a first marathon. Congratulations. 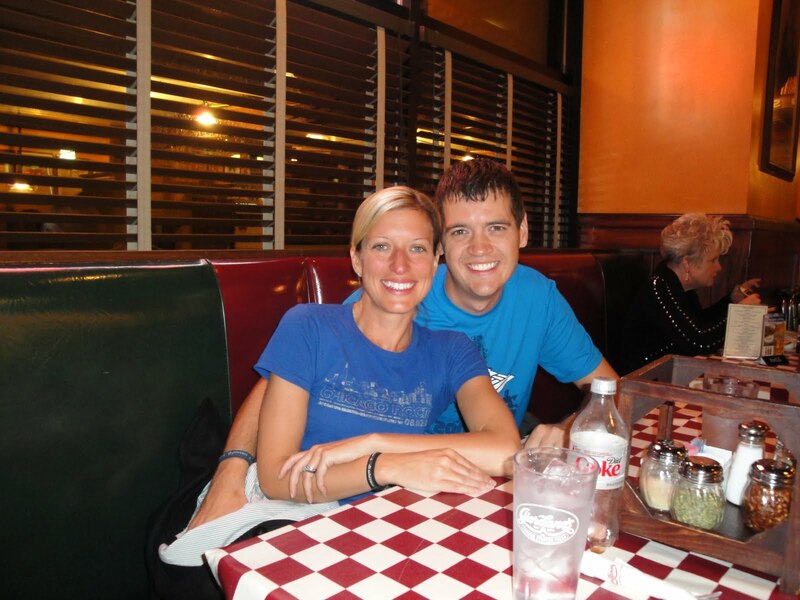 And Giordano's is a perfect choice for post run food. Thanks everybody!!! :DAlison and Karen – Mercedes Marathon is next! Valentine's day! I think it will be different than Chicago in that it is hillier and it is two laps of the half marathon course. I'm sure I'll learn a ton at it too!Jessica – Thanks! 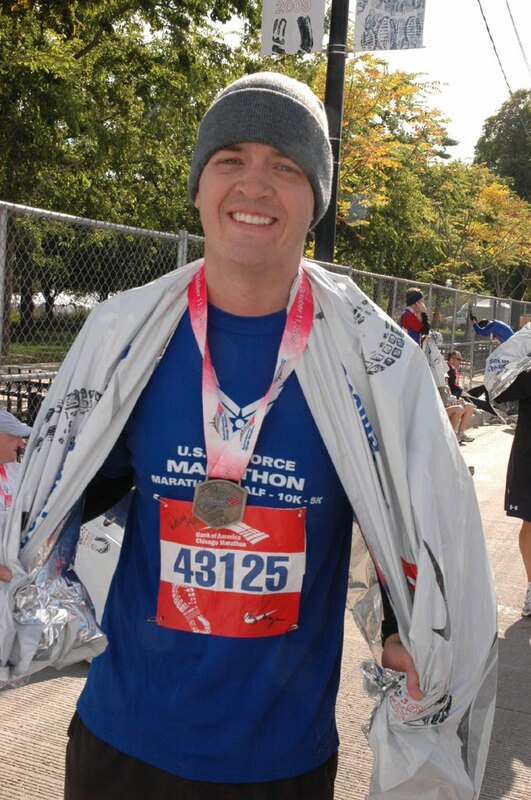 Yeah Chicago is a wonderful marathon for a first timer! Stephanie – Thanks for boystown name, I updated my post! They were such a fun cheering section!IRLAG – LOL! Thanks for the compliment, but I litterally showered threw my hair back and left, didn't care. Maybe there was a "runner's glow". :)Angie – Thanks! I saw your post in google reader and that you PRed your race by a whopping 11 mins!! And I LUV your series medal and jacket! You are an inspiration to me! Erin – I couldn't do the crowds justice with my lack of writing skill. They are insane! It's amazing the energy people can put out there. So many positive vibes in the air you can't help but get caught up in it.Krystal – Thanks! And thanks for checking out my blog!Stevi – I can tell you I was thinking about you guys when I was out there! 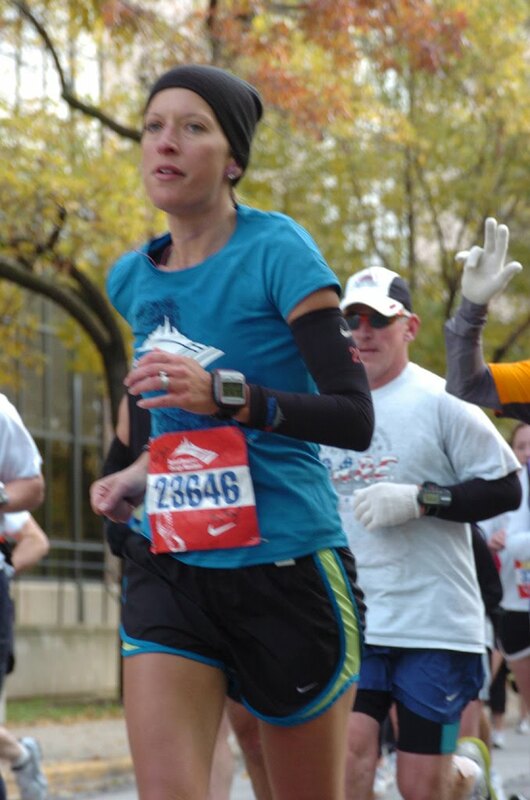 I am so ready to get out there and try more marathons! I only hope my 5K times keep improving. Good luck with your HM!! I can't wait to hear all about it and definitely want to meet up with you and your hubs for lunch! Meredith – Thanks! 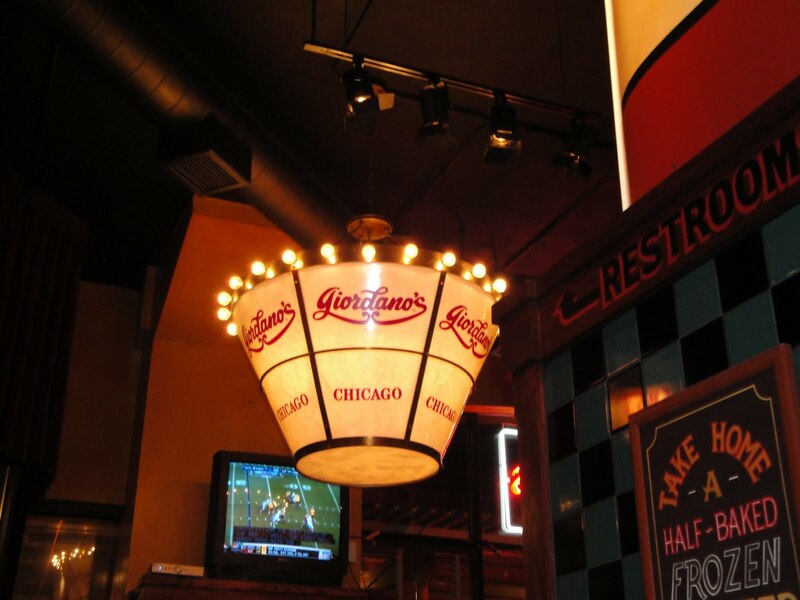 I agree, Chicago Marathon and Girodano's are perfect day really. Congratulations!!! That's an awesome time! Amazing time! I just knew you would have a kickass chip time. You should be so proud of yourself. Congrats again! What…? You ate a sandwich? No wonder your stomach was torn up. How in the world you did that, is beyond me. Anyway, way to power through it and congrats on being a MARATHONER!!!!! It has been a real pleasure watching your progression and improvements over the past months. 4:08 today, 3:08 10 years from now! You go, girl! Congrats on an amazing marathon! You are a rock star! Those are some sweet medals and your signed bib is awesome!! Congrats on the marathon!! Enjoy the recovery time! Great job and amazing time! So proud of you! Way to go, that's awesome! 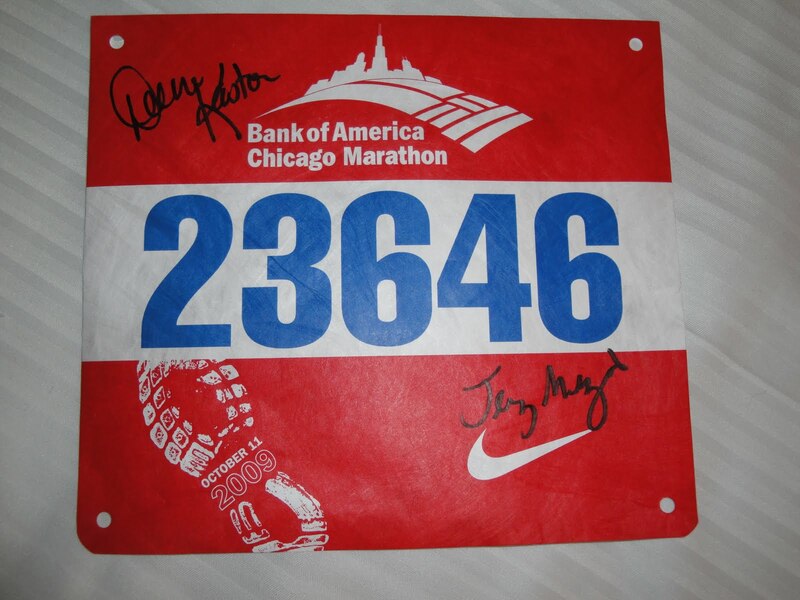 I also stood in line at the Spirit of the Marathon booth – we were probably close to each other! 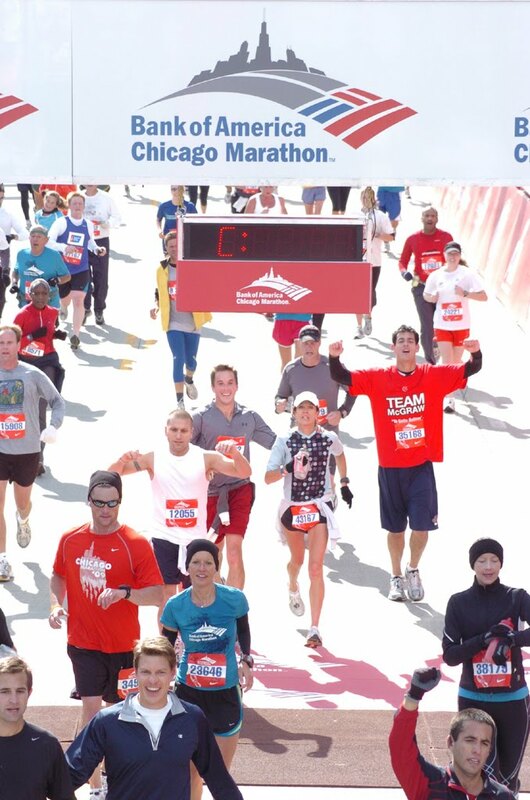 It was an AWESOME day for a marathon. So glad you both had a good one!